I was quite excited to be invited to taste the Summer Plates menu at The Capital Grille. 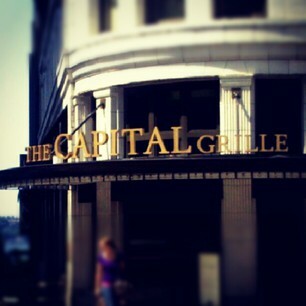 Located just a few minutes away from my work, The Capital Grille was my lunch destination last Friday. Not wanting to dine out on my own, I brought along my friend Lera who shared this experience with me and offered her culinary expertise on the meal. The Summer Plates menu allows you to sample “cool and refreshing flavors of the season” by pairing up a soup/salad with the main entree and a side. Lera and I resisted a complimentary basket of bread and made our lunch selections. We began with a Carrot Ginger Soup and a Green Salad. The soup was a major improvement from the last time I have tasted it – punched with more ginger flavor and a beautiful carrot orange color. Personally, I would’ve still loved more heat from the ginger and perhaps a texture contrast with croutons. The salad was just that – a salad. Lera and I agreed that mixed greens and possibly nuts would’ve dressed this salad up from business casual to business. There was little surprise when it came to the choice for the main entree. I selected the Seared Scallops with Sweet and Sour Tomatoes. OMG. The scallops were fantastic! Nicely seared on the outside, they were still creamy, and almost milky on the inside. They sat, proudly, on a bed of Israeli couscous. A drizzle of juice from a charred lemon rounded up this dish and made me smile. I would go back for seconds in no time. My beef loving friend ordered the Wagyu Cheeseburger with Fried Egg and Crisp Onions. When asked how she would like her burger prepared, she replied with the standard “As rare as possible.” And that’s pretty much what she got! I called it raw beef and she loved it! For our sides we enjoyed the crisp green beans with tomatoes and shallots and a salad of watermelon with cucumber and feta cheese. Usually, we would’ve picked out a dessert, but we were so delighted with our main entrees that we decided to stop there. Thanks again for hosting us for a lovely lunch.